Xiaomi yesterday announced that it will introduce its flagship Mi 8 smartphone in China on May 31st. 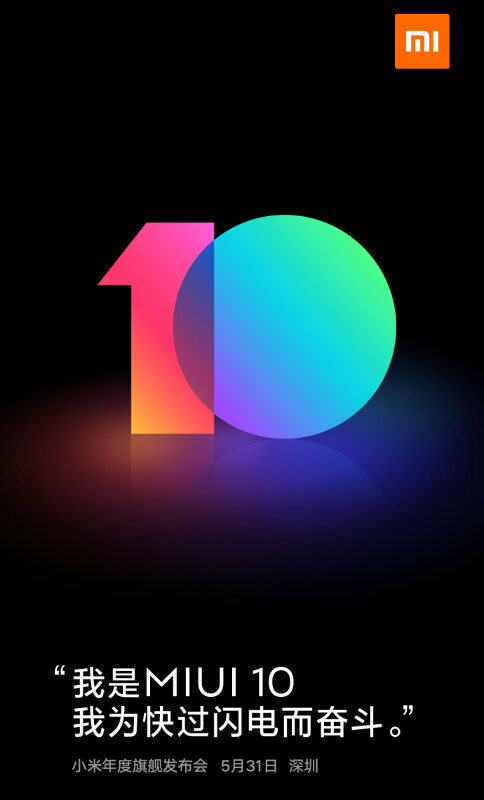 Today the company has confirmed that it will introduce the most-expected MIUI 10 ROM for its smartphones alongside. The company says that it will be lightning fast, and is expected to bring several new features. Xiaomi started development of MIUI 10 earlier this year, and last month it discontinued further MIUI 9 development to focus on stability and system optimizations for the upcoming MIUI 10. It also said that MIUI 9 updates are expected to resume for global devices after July, 2018 with MIUI 9.6, and Redmi Note 2, Redmi 3, Redmi Note 3 (MTK) and Mi Pad 2 are not compatible for MIUI 10 update. With MIUI 10, company’s focus will be on improving user experience using AI and Machine learning algorithms. The Global ROM is expected to get more India-specific features, similar to the MIUI 9. MIUI 10 will roll out in China first, which is expected to start from June, and the global ROM is expected sometime in July or August. MIUI 10 update is expected to roll out for most devices that got the MIUI 9, expect the device mentioned above. We should know the complete list when it is announced later this week.